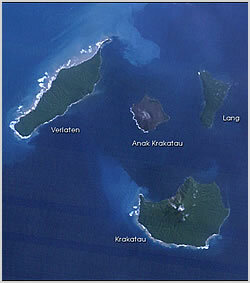 Krakatoa ( Indonesian name: Krakatau ) is a volcano near the Indonesian island of Rakata in the Sunda Strait. It has erupted repeatedly, massively and with disastrous consequences throughout recorded history. The best known of these events occurred in August 27, 1883. Today the diving at Krakatoa is mostly for divers who revel in the odd blacks shapes, caverns, and swimthroughs created by the lava rocks. The cracked and sharp edged rocks make a west facing submarine cliff look like ancient ruins of a temple. The dive sites are very much alive in terms of fish life, but the coral doesn't quite match up to what you'd expect from Indonesia. Karang Serang often has thermoclines and very strong currents which attract the bigger tuna and barracuda. Some huge Angelfish are also often spotted here. Another spot named Moray Point offers just that, if you can find them hidden in cracks along the walls. A rock canyon surge dive can be done at Sangiang. There are several large wrecks in the Straits including the USS Houston and HMAS Perth. The Houston lies in shallower water to the north on the edge of the Java Sea. Getting there : Road from Jakarta, boat from Carita.